Kids, Cows and Grass: Supermarket beef is raised by farm families! I have talked to people in grocery stores in Manhattan, Kansas and Manhattan, New York and they all have the same concerns--is supermarket beef safe and good for me? I actually love getting this question. I usually tell them that we own a ranch in the grasslands of Kansas. We are in the middle of cow-country with more grass than crops. We are focused on taking care of the environment, and frankly, the reason the grasslands still exist is because the ranchers figured out more than a century ago that this grass is highly nutritious for cattle and they fought to protect the native grassland. Today, I work beside my husband and my kids to care for our cattle in good weather, and in bad weather. Every day we work to give our cattle and land the best care we can. And...I love cattle! Then they ask me, "Where can I buy YOUR beef? I trust you and want to support family farms like yours." I smile and say, "right here....in the meat case in your local grocery store or off the menu at the restaurant you are at on Friday nights." I do not grow "Debbie's Beef," but if you want beef raised by families like mine across the country, just go to your local supermarket and pick up a package from the meat case. Some people try to tell us that beef is safer/better/more nutritious depending on where you purchase it. I am here to tell you that all beef is inspected by USDA inspectors and is as safe, and maybe safer than the beef sold at farmer's markets. Don't get all crazy...I'm NOT knocking farmer's markets! But please don't knock my beef either! "How can you eat beef if you really love cattle?" My answer to this question is simple. I believe that ranchers do truly enjoy being around cattle. I also believe that we have a responsibility to treat our cows and calves with respect--that means we provide everything they need to have a good life including space to roam and abundant food and water. We do all we can to keep them warm and dry in cold, wet weather of the Kansas winter and opportunities to cool off in the heat of a Kansas summer. And I demand that of everyone in the Beef Community. I raise cows and they each have a calf every year. I am really good at raising cows and calves. But I am not as good as the experts at feeding a steer destined for my plate. So I send my calves to a feedyard. For example they have people there who are so focused on their job of caring for cattle that all they do every day is ride a horse through the pens of cattle, looking for any symptom of illness or discomfort. When they see that a steer looks like he has a fever or a sore leg, they will take them to the hospital pen for examination and treatment. I trust those guys. They know what they are doing! These are my steers in the feedyard. Looking good! You know, at my house in the winter, we have lots of cattle kept close to monitor them and care for them in the cold weather, but in the feedyards there are thousands of cattle kept in large pens. So feedyards are routinely inspected to make sure they are managing the waste products in a safe way, as well as taking care of the water and the land in a sustainable way. Feedyards are heavily regulated for environmental factors and inspected on a routine basis. Frankly, they produce less waste run-off than many yards and gardens in the city! If you want to know more about what happens in a feedyard, check out my series on Life in a Feedyard, by Nicky Tiffany. After the feedyard, the packing plants may be the closest thing to a factory that cattle see, but I know that during slaughter and processing, my food has been handled by trained professionals who follow regulations to keep my food safe. There are inspections at all steps along the chain to make sure that the packaged beef that comes out of the plant is safe and nutritious. I trust those inspectors. I trust those professionals. I eat supermarket beef. "Wait, what did I just say?" Yes, I sometimes have a steer that I will take to the local locker plant for slaughter for my family to consume. But I do still buy beef in the local Walmart, Dillons, HyVee or Ray's Apple Market to feed my kids. Specifically, I always look for sales on Flat Iron Steaks--and when I see a sale, I stock up! I buy ground beef, ground pork and sometimes chicken breasts at the local store. 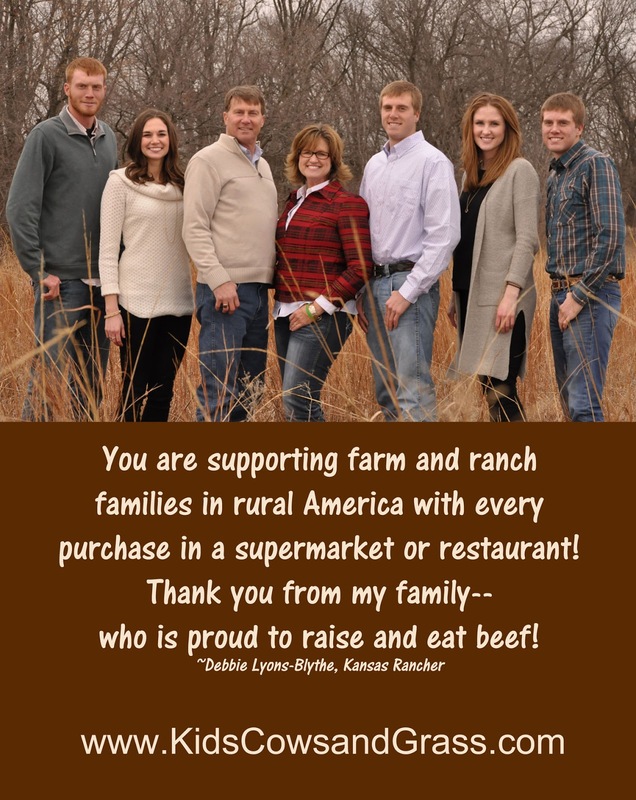 I trust the people along the way to do their job and provide delicious, safe and nutritious meat for my family. I always swing my cart over to the meat case when I buy groceries. I often talk to other shoppers to see what recipes they are using or what cut of beef they are buying. And I love to tell them that it is people like me who raise beef that they can buy in the store or order in a restaurant. I am proud of my role in the beef community. It is people like me, all over the country, who raise cattle so that you can zip into the local store with a grocery list and pick up a chuck roast for supper, or ground beef for tacos or even a couple of KC strip steaks for the grill. You are supporting farm and ranch families in rural America with every purchase in a supermarket or restaurant. Thank you--from my family who is proud to raise and eat beef. For more information, check out another of my blog posts: Eat Beef and help the planet! A few years ago, I hosted a gal from New York City to our ranch to talk about the beef in grocery stores...see what she learned in my blog post: My Ranch hosted Rebecca, a viewer from Anderson Live! I like the comments, thanks for taking care of the food. I've had this same conversation many times with folks. Its kind of fun to think that you could be buying my beef at your grocery and I could be buying yours. The more cattle farm families I get to know the better I feel about the beef I'm feeding my family. We're all working together to raise safe, nutritious beef! I know! I often think of that when I buy at the grocery store. But at least I know it is beef raised by people just like me! Thanks for your comment. Yes Billy, you are right. Dairy cows do get used for ground beef. They are also inspected and cannot have any resides just like regular beef animals. It is very safe and nutritious and a huge percentage of dairy farms are also family farms! What a great article! My husband has been a meat cutter in retail grocery for over 25 years. My daughter has married a cattle rancher and many of our family and friends are ranchers and farmers. We have always raised our own and purchased from the store! Thanks to you and your husband, Donita! I have come to appreciate everyone along the journey of making supper for my family! Meat cutters are some of my favorite people!! Hello I am in Iran and I wish someday we would have American ranchers here in Iran so they could train Iranian ranchers as how to raise cows for their delicious steaks . Hahaha! I know--there is nothing as good as an American steak! Whatever you prefer--we have it for you! Choices. That's America! This entry reads like meat industry propaganda. And you still didn't really answer the question about how you can eat beef if you really love cattle, probably because there isn't an answer. You either eat beef, or you love and respect cattle. Can't have it both ways. I wish you had left your name, as you probably won't see this follow-up comment. But I disagree with you--I can definitely care deeply about cattle and still understand that they are destined for beef consumption. It is all about respect. Cattle are not pets--but they are creatures that deserve the best care we can give them. And I work to do that every day.